Glum, grey, rainy landscapes build up like clouds in our mind when we think about a typical British Autumn & Winter period. Research has shown that over the winter months, in particular, we spend less than an hour outside each day which has a direct effect on our health and mood. Lack of outdoor time can lead to seasonal weight gain, increased stress levels and has a knock-on effect on work performance. However, just because Summer is over it doesn’t mean that you can’t bring the outside in and the inside out with a stunning Sunroom and thoughtful garden organisation. Read on to find our top tips that will enable you to spend more time outside this coming Winter. Part 1: Bringing the Outside In! Even during the Autumn months, you can still enjoy panoramic views from a well-designed Sunroom. Fresh, sunny Autumn days are perfect for enjoying the garden as you relax between your Sunroom and the outdoors. It may seem obvious to say, but planning in the right number, type and size of windows, (including into the roof of the extension) can make a significant impact on your living space. According to leading supplier Velux – “7 out of 10 extensions do not have roof windows”. 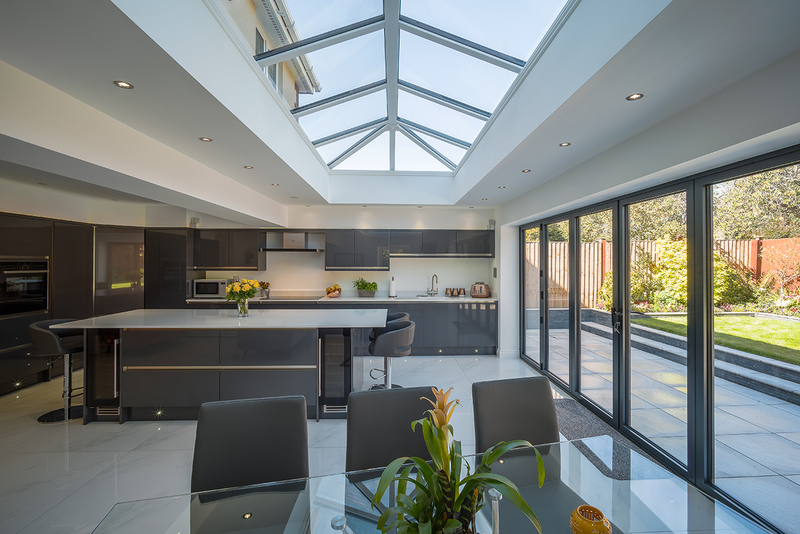 Whether you have a flat roof or a pitched roof, there is a wide choice of glazing options available. Velux also advises that your combined roof and vertical glazing should make up the equivalent of 15-20% of your floor space. Excel Home Design will work with you to ensure a well-planned lighting strategy to ensure your Sunroom is a light, airy space even in Winter! During the Autumn months when the weather is mild, you will still want to take advantage of your garden and patio. Mild temperatures during the Autumn months offer a perfect opportunity to get the fleece on and spend some time between the Sunroom and the patio. 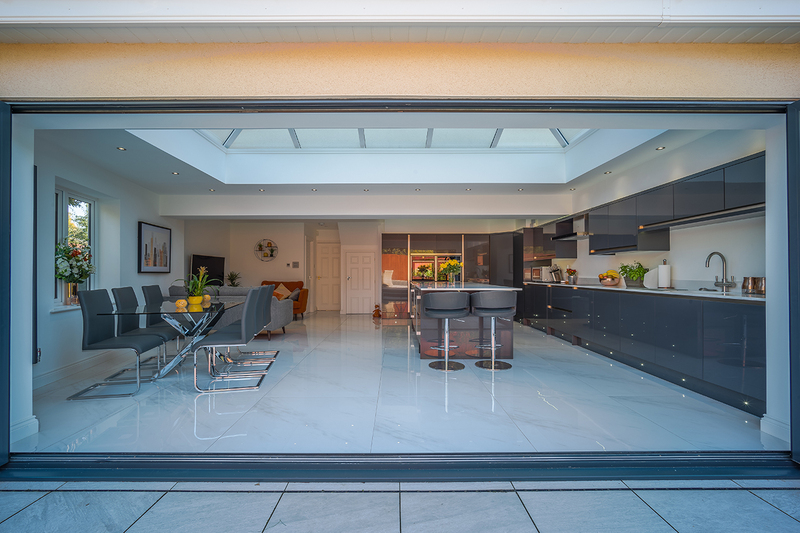 Bi-fold doors are perfect for providing the transition between the in and outside. 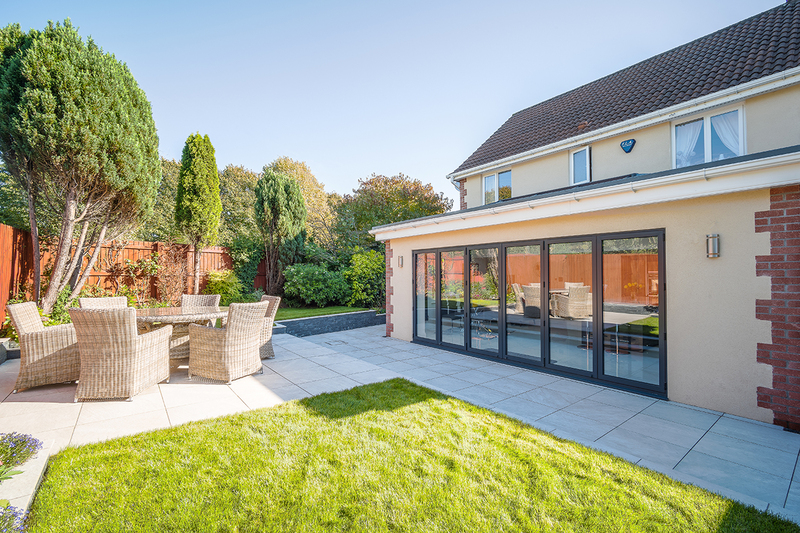 Bi-folding doors are perfect for connecting your Sunroom to your garden. With their slide and concertina effect, you can manage space and enjoy some fresh air and a cappuccino from the comforts of your second living room, with nature only an arms reach away. 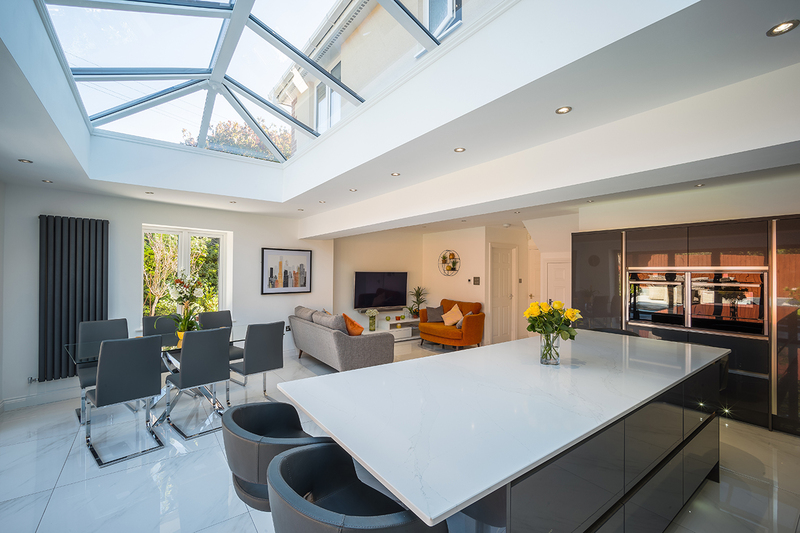 Light in the Sunroom is also improved with the addition of Bi-folding doors, which work extremely well with Velux windows to maximise the light levels. Stylish and practical, the Bi-folding doors also add a touch of class to your Sunroom. Part 2: Taking the inside out! If you have some particularly clement days for the Autumn period, here are some tips to maximise your enjoyment in the garden. 1. Move your garden furniture to more sheltered areas, such as against the wall of the house, so that they keep drier. It may be worth investing in weather-resistant furniture, or perhaps consider items that have a canopy included which will provide cover from the elements in the colder months, but also provide shade when used in Summer. 2. To many of us Brits, we associate the Autumn/Winter months was being wet and cold, so if you really want to make the most of your outside space, the best way would be to provide shelter from the elements – this could be as simple as a pop-up Gazebo or large garden parasol. If you are after a more permanent and weatherproof addition to your home that allows you to use your outdoor space no matter what time of year, then the creation of a garden room would be a wonderful addition to your home. One of the benefits of a walled garden room is that you are protected from the elements and, if the sun does show itself, those doors can always be opened. 3. Add a heat source and suddenly your patio has the cosy factor. An easy addition would be a chiminea, a firepit or a patio-heater, which you see in use in outdoor eating areas of restaurants. 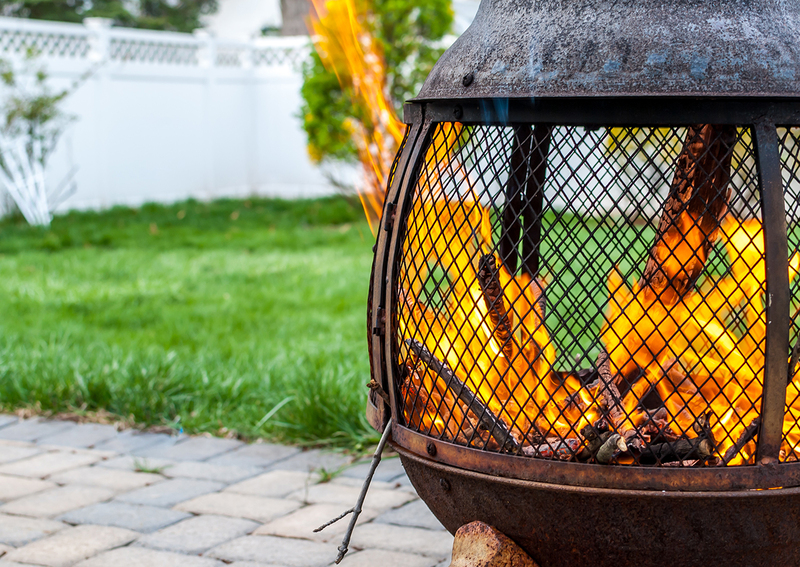 If you really want to make the ultimate outdoor area, then consider building a permanent outdoor fireplace. After several years of deliberating whether to move house or extend, we finally decided to make plans for a large extension for a new kitchen and living space. We consulted a few building companies but had no hesitation choosing Excel Home Design to proceed with our project. Right from our initial meeting with Russell we were impressed with his professional attitude and can-do approach. He took the time to understand exactly what we wanted to achieve and gave us advice and guidance on how to get the results we wanted. Everything was transparent and any changes made or extras added were priced up and agreed to beforehand. As a result, there were no unexpected costs, which can often be a concern during a project. Having Russell as the main point of contact during the whole process was invaluable—it gave us complete confidence. The overall project management of our build and all the tradespeople involved were amazing. We were always kept informed of what would be happening the next day, what deliveries would be arriving and who would be working. Every single person involved in our project was efficient and professional but also polite and respectful to our family and home. Although never compromising his high standards, attention to detail and quality of workmanship, Russell and his team pulled out all the stops to complete our build before Christmas—for which we were extremely grateful. We’re absolutely delighted with our new kitchen extension. It’s surpassed all of our expectations and made a huge difference to our family home. Everyone has been amazed at the transformation and can’t believe what has been achieved in such a short amount of time. We’d wholeheartedly recommend Russell and his team at Excel Home Design for being professional, reliable, and trustworthy, but also extremely patient and respectful. Thanks guys! If you would like to book a no-obligation Creative Meeting with our Award Winning Director then please click here or call us on 01443 561 540.